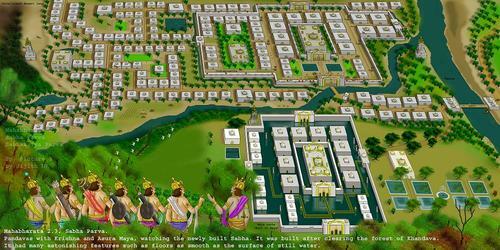 Indraprastha was the capital city of the kingdom of the Pandavas. The Pandava kingdom was the western half of the Kuru kingdom. This territory lied to the west of river Yamuna and to the east of river Saraswati. The city of Indraprastha lied to the western bank of Yamuna. It was all forest and bush land when the Pandava king Yudhishthira got this territory. With the help of Krishna, he made it into a prosperous city. Krishna himself had the experience of building the city of Dwaraka in the ruins of the old city of Kusasthali in an island in the western sea shore close to the mouth of river Saraswati (in Gujarat). 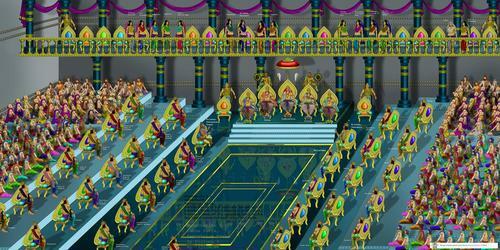 The Indraprastha of the Pandavas roughly coincides with the Indraprast sector in Delhi, the capital of India. The Pandavas also built other cities like Panaprastha (modern day Panipat) and Swarnaprastha (Sonipat) in their territory. There was a large forest and bush land called Khandava surrounding the city of Indraprastha inhabited by Nagas, Rakshasas and Asuras. It was under the rule of the Naga chief Takshaka. Krishna and Arjuna cleared this forest by burning, since it posed a threat to the city. The tribes of Nagas, Rakshasas and Asuras who inhabited the area were either killed in the encounter or were forced to move out to the west. Some of them settled in the Salwa kingdom in the west and some other eventually settled in Gandhara in the far west. Takshaka later dewelled in Takshasila and revenged Arjuna by slaying Arjuna's grandson Parikshit by poisoning him with snake venom. During the Khandava fire ,Arjuna and Krishna saved Maya an architect belonging to the Asura tribe. As a tribute for saving his life Asura Maya built the famous Maya-Sabha (the Assembly Hall of Maya) for Yudhishthira the king. 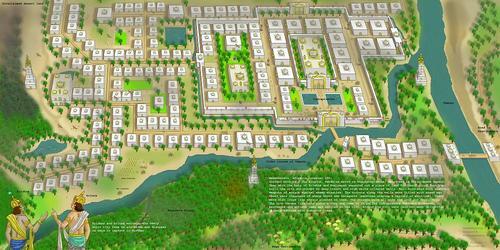 The city of Indraprastha was often compared to Bhogavati the capital city of the Naga territories in Tibet. The city was however named after Indra the king of the Devas, whose territory also lied in Tibet.